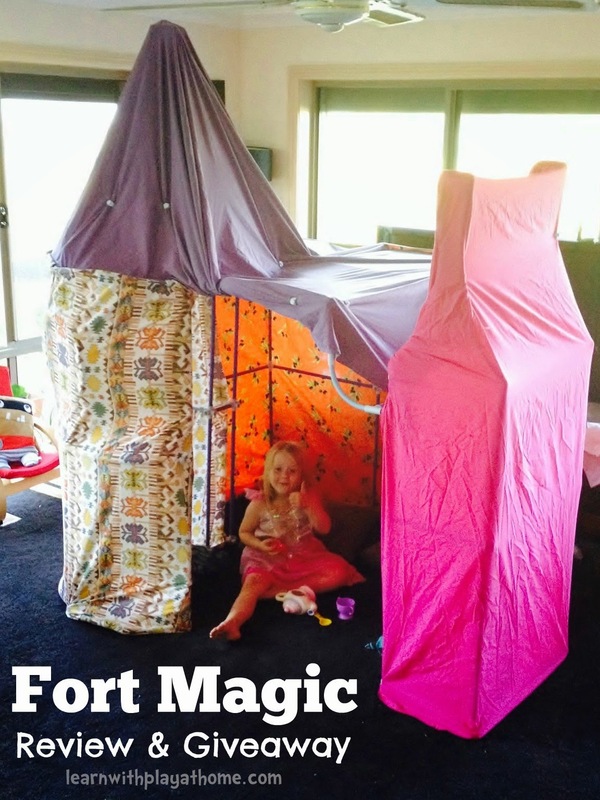 Fort Magic is an innovative and creative construction kit for kids, and as such, when they contacted me to see if we'd be interested in reviewing one, we absolutely jumped at the chance. One look at the possibilities for fun and learning this kit contained, and I was very eager to see what it was really like and if it could live up to it's potential. At $199 USD, it's the kind of item that you'd want to think was good quality, that your children would gain from and was going to last you for years to come. If you're interested in finding out what we thought and for a chance to win a set, keep reading. When our kit arrived we were excited to start building. We got out our supply of play sheets, (a collection of old/odd sheets and material that I'd reserved for play and building forts) and opened up the box. I was really happy with what I found. The idea of managing 382 pieces with a 5 year old and a 2 year old was something that had been concerning me a little, but after pulling out all the pieces, I was pleasantly surprised. Everything seemed to be really good quality. The plastic rods were thicker and seemed more durable than I was expecting and everything was colour coded, separated and easy to sort out. There was an excellent quality storage bag included and I appreciated the little extra details, like the high quality of the thick, glossy 28 page colour manual and the handy grip stick remover. 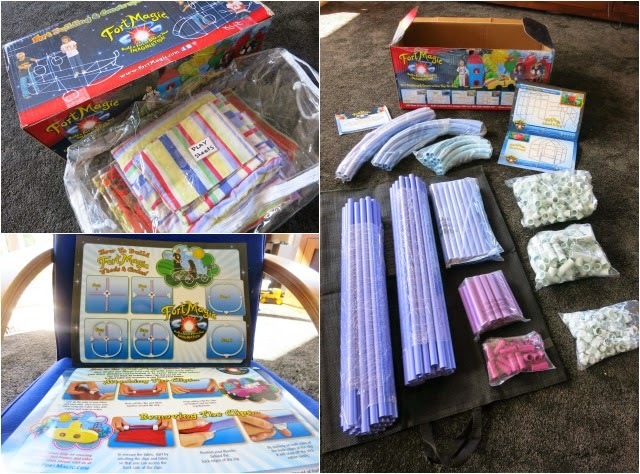 Once we'd taken all the materials from their packaging and organised our smaller pieces and connectors into large plastic zip-lock bags (I like to keep things as manageable as possible with young kids), we were ready to build. 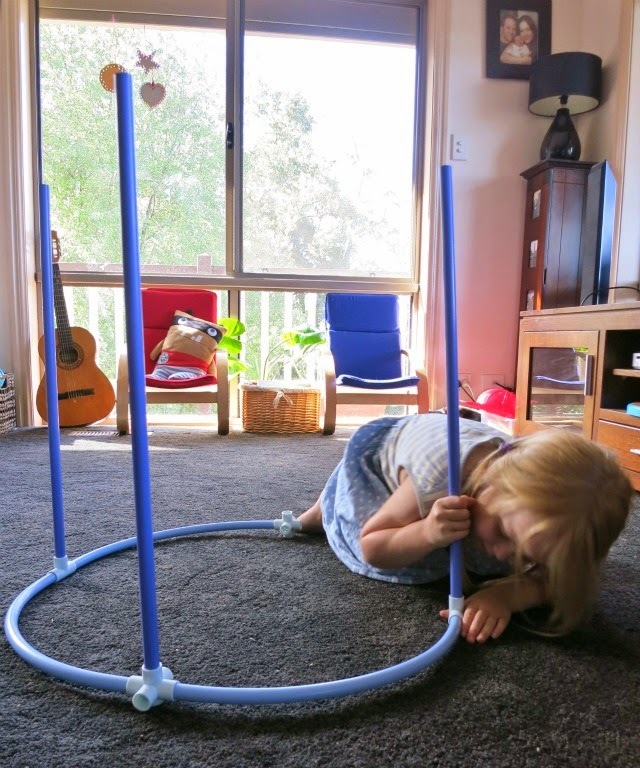 Before looking through the manual to learn basic constructions or to choose a model to build, Maddie (5) started putting parts together because she wanted to build a tee-pee. The shape of some of the connectors had inspired her to make a triangular shape and she could see a quick and easy way of doing it. It took a little bit of problem solving for her to get it to stand as the connectors available weren't on certain angles that she needed. It was great to watch her figuring it out and going through the parts, talking about lengths and angles as part of a natural conversation. No forced learning, just play. 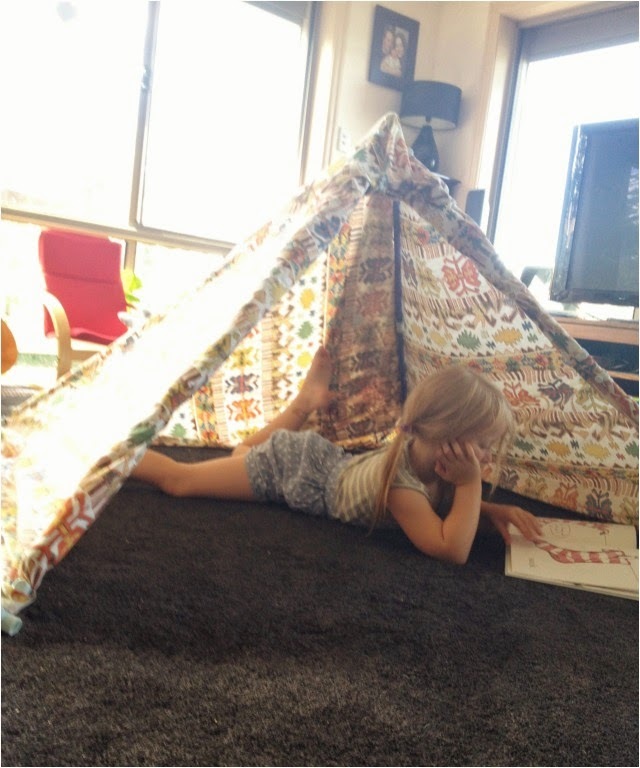 With her tee-pee built, she settled in to read a book. It wasn't long though before the draw of the huge creations illustrated in the Fort Magic manual and on the side of the box prompted her to pull it apart and pour over the manual until she decided upon the (rather huge looking) Mansion design. I figured if we could build this one, we could build anything. So we set to it. At 5, Maddie was content with her Dad looking at the manual and then telling her which part she needed and where it would go. It was definitely a family effort with kids this age, but it wasn't difficult at all and it was part of the appeal of Fort Magic for me. Something that we could do together as a family and build memories together. There was fun, laughter, fine and gross motor skills, language and colour skills. We talked shapes, patterns, length, measurement and angles. We counted, sorted, solved problems and worked together. Ta-daa! Pretty cool, huh? The kids found it so exciting, even without any material coverings. 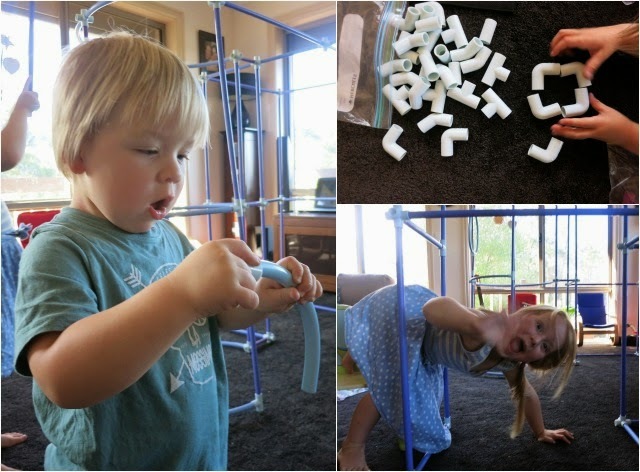 Using our play sheets and the included material clips, we easily clipped the material around the mansion. The second it was done, she was off to change into a princess gown and gather supplies. I wanted to make more designs but the kids just didn't want us to take it down. As we'd built it in the middle of the living room, I wanted it moved that night so we were happy to find that we could shift it easily without having to dismantle it. The kids really loved it and did everything in it, from eating breakfast, to playing imaginary games, relaxing and reading. It's still up but I'm planning on taking it down soon so that we can try out a new design next weekend. Overall, my entire family thinks this is a fabulous product and is something that will last us for many years. We'd happily recommend it to our friends and family. We can't wait for all the memories that we will build at the same time. 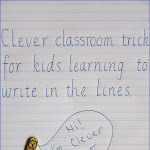 To read more about the educational benefits of Fort Magic or to order your own set, see the website. You can also check out what other customers have had to say here. 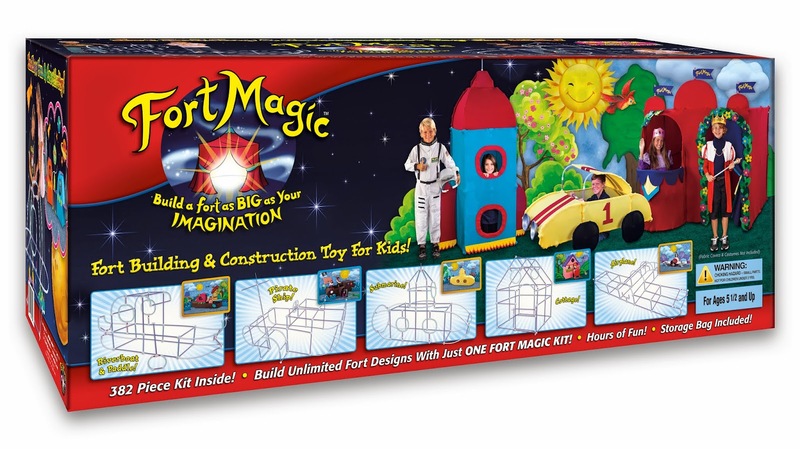 Thanks to the generous people at Fort Magic, you have the chance to win your own complete set, valued at $199 USD, for your home, center or school! The competition is open to residents of US and Canada and includes shipping. Enter easily via the rafflecopter below and Good Luck!! Please note: If you are commenting on the blog using the "anonymous" profile, please also include your name. If you are trying to leave a comment from a phone and are having difficulties, please try again from a desktop. 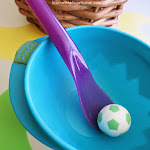 This kit is amazing and my kids would love it! I love that FORT MAGIC has a 30 day money back guarantee. This looks well worth the cost and your children looked like they were having so much fun! I would love to have this for use at home with my son and nieces and nephews and at work with my children. I hope you have many years of happy building with it. I like that you have the option to buy directly from their website. I love that this is a toy that we could play with for many years to come. I'm sure we'd get a ton of use out of it! Very cool! What a perfect solution to one of childhoods most beloved pastimes! These forts might actually hold up and help the kids aid a pile of books landing on their head! I very seriously doubt we'd need the 30 day money back guarantee but that is a nice option! I love this! And the fact that they have two different sizes, and that they have easy to understand instructions right there on the website... Seriously, what not to love! Thanks for sharing this! My son loves blanket forts! I'll have to remember this for his next birthday or Christmas! It's nice that they have some choices that aren't just for girls or boys and if you can use your own sheets/fabric you can pick colors your kid enjoys. I love that you can build ships, cars, rockets... this is just so cool. My children would love this! I like that you can make a rather large fort but when you take it apart it stores nicely and takes up minimal space. I would LOVE to have this to play "make believe" with our grandchildren! I didn't realize how versatile Fort Magic is!! I like that it shows you slide shows of the designs especially for a gal like me who sometimes finds building difficult. I just love that kiddos can build designs by themselves since the pieces go together so easily! I love that there are so many different ways to build it and then the clips allow you to use the blankets and sheets you already have! So cool! Very cool, i like the castle! Loving the clips to keep the sheets held on. We had a previous fort building system and they always slid right off. I love the rocket ship..what hour of imaginative fun this would provide the kids! I love that the forts can be moved around without having to be taken apart first. Thank you for the chance to win! This looks awesome, thanks for the giveaway! What a cool set! 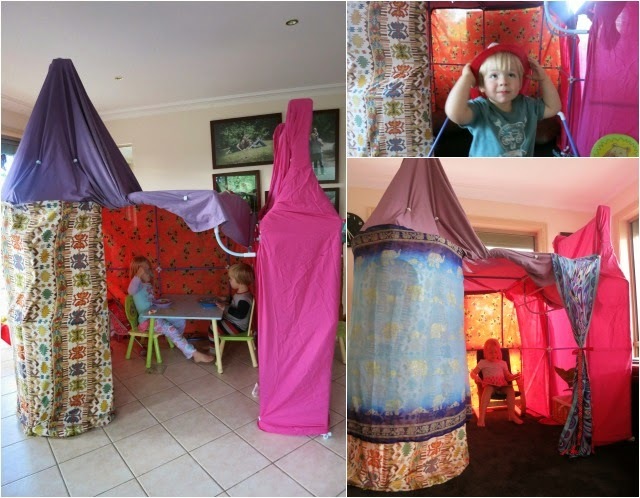 I love all the different designs they have - and that kids can design their own forts. My boys totally want the pirate ship fort! I love that there are curved pieces in this fort kit, so many possibilities! I had fun looking at all the possible designs on the Fort Magic website. LOVE this! I love how many different ideas you can come up with this! This would've been so awesome to have as a kid! What an great idea to have the clips for the fabric too! I love that it has curved pieces, it really opens up the possibilities! My kids would love this....so many possibilities! The space ones are awesome! I love that you can make so many designs from just the one kit. And the money back guarantee - love a company that stands behind its products. I like how you can make so many forts with one kit! So many possibilities with the kit. My kids would love it! Love the idea of fabric clips and curved and different size pieces...can create endless things! I love all the designs you can make and that they're all available online. I love that this makes different shapes than boxes. 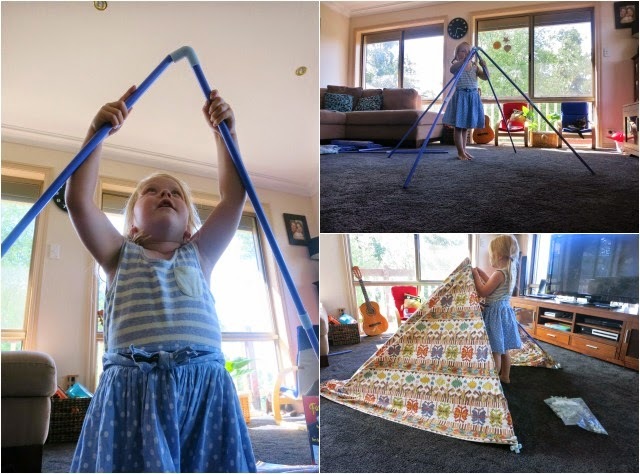 A few years ago my children received a fort making kit from their grandparents and the poles are stiff and break easily (we've lost around 5 of them and the only way to replace them is to buy a new kit) and they only make boxes/triangles. This kit makes all sorts of designs! I love how their kits really do let you build as big as your imagination (just like their slogan says)! My boys would love to build with this kit! This looks like a lot of fun, kind of like the legos of fort building. I know my daughter would love this. Wow! What an incredible set...my girls would spend hours inside playing. Wouldn't it be fun to take a nap in the fort?! Thanks for sharing. Woah- this is amazing!!!!! I have 4 kids, and will be fostering more soon. I would absolutely LOVE this set because all of the kids could play together, despite their age differences!!! I can't believe there are over 300 pieces in the set??? That is incredible! 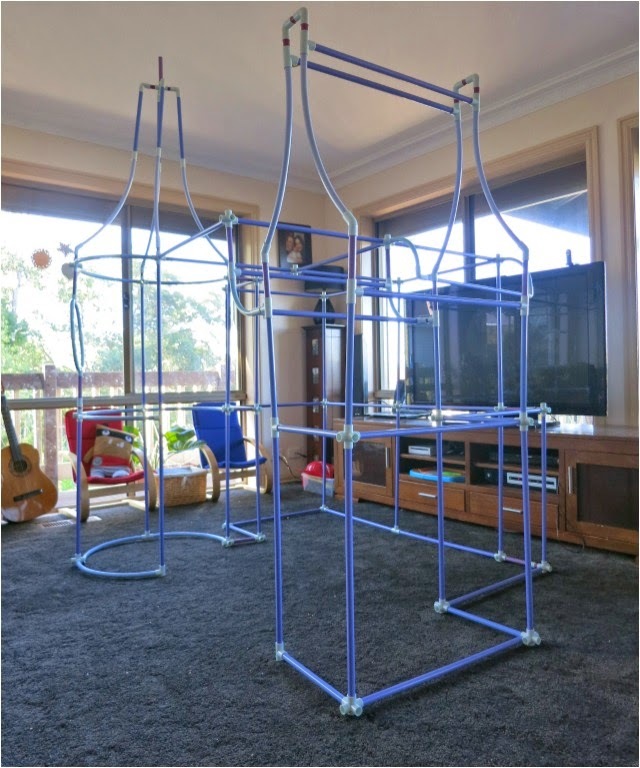 This looks like hours of fun building and playing in crazy forts. I was just talking about building forts as a kid and how we were limited to the furniture we could move and drape sheets over. This looks like such a flexible toy, my son could build almost anything he could imagine. I noticed a spaceship design on the website... My oldest would love that! I love the little corner on Fort Magic's website that links you to all the different blogs reviewing their product. 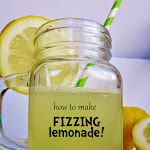 It's been a great way for me to find new blogs, enter giveaways, and get inspiration for our kit when we get one. My daughter loves to build things - her favorite thing - and she would Love to build the Rocket - since one her jobs she wants is to be an astronaut! I love building forts but always have a hard time when using chairs or tables as they either fall down or I don't fit under them. This kit looks like it would be sturdy as well as something I could sit under without laying down. It looks like a ton of fun! 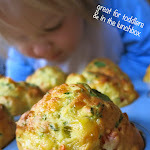 I love all the possibilities and the endless amount of fun my kids could have!!! Love that it comes with a storage bag for all those pieces!!!! I love how open-ended this is for play!